The Indian government has approved the procurement of ten missile-armed Heron TP (aka IAI Eitan) unmanned aerial vehicles (UAVs) to be operated by the Indian Air Force (IAF) The Economic Times reports. The $400 million procurement program was revived at the beginning of 2015 by the highest levels of government–the Indian military already wanted to purchase armed Heron drones in 2012 but did not get the political backing–and the first drones are slated to enter Indian service within a year, according to a source interviewed by the Economic Times. 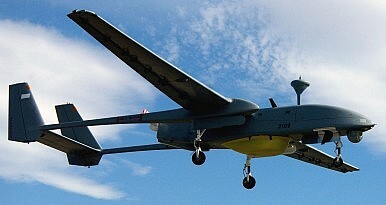 Produced by Israel Aerospace Industries (IAI), the Heron TP is a medium-altitude, long endurance UAV with a range of around 7,400 kilometers (4,600 miles) and a maximum flight time of around 36 hours in favorable weather conditions. The drone can be deployed for a range of different tasks including intelligence, surveillance, reconnaissance, and long-range strategic strike missions. India’s new Heron TP UAVs are capable of carrying a payload of over 1,000 kilograms and will be armed with air-to-ground missiles, according to Indian defense officials. The UAV will likely be deployed in counter-insurgency/terrorism operations to take out targets outside of Indian territory deemed too risky for manned aircraft. “It is very good if something like this is happening. Instead of sending a pilot in a high-risk area, it is best to use an armed drone. The system can also be used for a surprise, sneak attack,” according to former Indian Air Chief P.V. Naik. India is already operating a total of 176 Israel-made drones including 108 IAI Searchers and 68 unarmed Heron-1 aircraft for surveillance and reconnaissance missions. The IAF also fields a fleet of IAI Harpy drones – a self-destruct aircraft carrying a high-explosive warhead and primarily used for taking out enemy radar stations. Between 1985 and 2014, India was the top importer of UAVs worldwide. India’s Defense Research and Development Organization is also developing an indigenous armed UAV, labeled the Rustom-II, however the program has experienced a number of setbacks. “Development of the Rustom-II has been delayed on account of challenges with efficient design as well as the cancellation of export licenses by the U.S. State Department of the American origin actuators that were being used in the Rustom-II. India has now had to develop indigenous replacements for those actuators and the Rustom-II will fly with those this year,” according to Saurav Jha writing for The Diplomat. As of yet, no armed flight trials of the Rustom-II have taken place, according to the Economic Times. India and Israel are also in talks to co-produce UAVs in the future.